"That’s why many people have voted!" 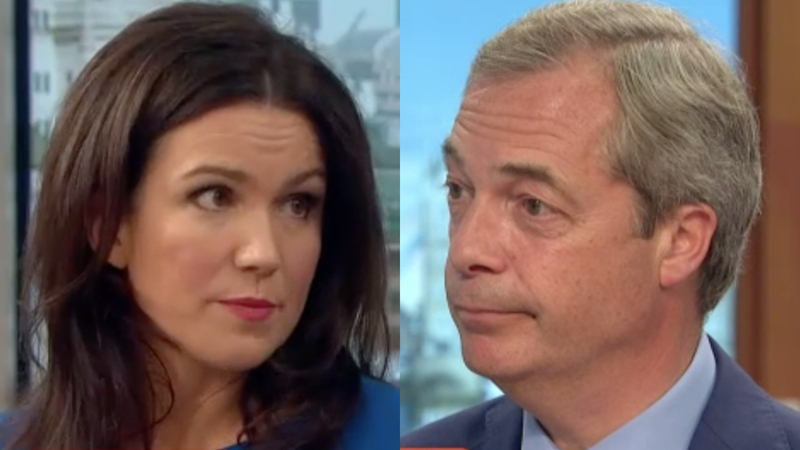 Susanna Reid was barely able to hide her disdain for Nigel Farage when the two met on Good Morning Britain today. Farage appeared on the breakfast show in the wake of the dramatic referendum result that will remove Britain from the European Union. UKIP leader Farage backtracked on the leave campaign’s claim that exiting the EU would mean a £350 million weekly boost to the NHS. Reid turned Jeremy Paxman after Farage said the claim was “a mistake”, barely able to hide her disdain at the far-right politician. “That’s why many people have voted!” Reid said. “You’re saying after 17 million people have voted for Leave – and that [NHS advert] was a huge part of the propaganda. Farage fired back saying he was “ostracised by the official Leave campaign”. “It wasn’t one of my adverts. I would never have made that claim. That was one of the mistakes I think that the Leave campaign made,” he said. “Do you think there are other things that people will wake up to this morning and find out won’t happen as a result of voting this way?” Reid then asked, only to see Farage dodge the question and reel of his sales pitch for an EU-less UK.